Don’t look at the screen either if you can avoid it. Brilliant clue beams of light are apparently the first clue that an alien race is heading our way to relieve Earth’s citizens of our brains. Then for just less than 90 minutes Skyline proceeds to show us all that perhaps that isn’t such a prime target. I hated Skyline from the rap video it desperately wanted to be in the first 30 minutes through to the final hour of asinine nonsensical drivel. 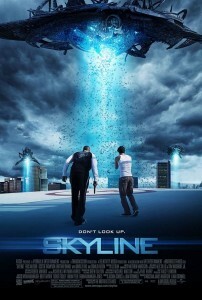 I hated the fact that Skyline makes Battle: Los Angeles look like Terminator 2 and Aliens combined. I hated the fact that EVERY SINGLE EPISODE of Battlestar Galactica straight up murders every element and moronic plot development in Skyline in terms of plausibility, tension and most of all enjoyment. I hated the bad teen-friendly music that dominated the first 25 minutes, and bad acting, the bad dialogue and bad filmmaking that dominated the rest. I hated the fact that Donald Faison is allegedly somewhat of a ‘baller’. I hated that I spent half the film wondering if the chick was Olivia Wilde – only with a Lego head. I hated the fact that the movie finished… and then kept going for another interminable and totally baffling 10 minutes that only enraged me further. I hate the fact that somewhere in the world some 15 year old boy eagerly places his first ‘adult’ sci-fi DVD in the tray and settles back to watch this film. I hate the possibility that as the credits roll that same boy wonders if that is really what he nagged his parents for in the preceding days. The only thing I might hate worse is if the boy actually decides he likes this. Final Rating – 3 / 10. I can only hope that the alien beings were filming a reality show for their home planet called ‘The Dopiest Catch’. If this film represents just how advanced we are then we deserve to be taken over.